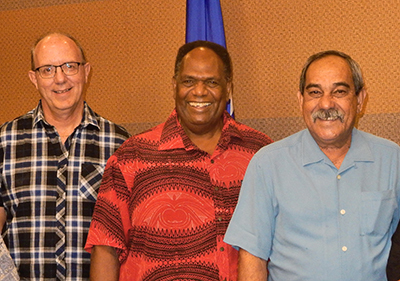 Pohnpei, FSM—This week a high level bi-partisan delegation from Australia paid visits to the Micronesian sovereign nations in the North Pacific including the FSM. 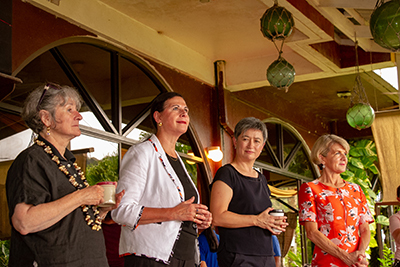 The delegation consisted of Minister for Foreign Affairs Julie Bishop, Minister for International Development and the Pacific Concetta Fierravanti-Wells, Senator for South Australia and Shadow Minister for Foreign Affairs Penny Wong, and Senator for Queensland and Shadow Minister for International Development and the Pacific Claire Moore. The visit was facilitated through the hard work of Australian Ambassador to the FSM George Fraser and his staff. Traveling aboard an Australian Navy jet, the party travelled from Palau to Pohnpei on Monday June 4. They spent the next morning touring the FSM’s World Heritage Cultural Site, Nan Madol before their motorcade headed to Palikir for bilateral meetings with President Peter M. Christian and his cabinet members. At an afternoon reception for volunteers from Australian Volunteers International and for Australian scholarship award recipients at Orchid’s Restaurant at Ocean View Senator Wong underscored the importance of the visit. She said that anyone who follows Australian politics would know that their parliament is a noisy place with many disagreements among the members of the party of power and their opposition. She said that one thing they agree on is the importance of Pacific Island nations. Pohnpei—The Secretariat of the Pacific Community has released a 55 page assessment of sea cucumber stocks in Pohnpei waters. The result suggest that sea cucumber stock have not recovered from a long history of harvesting prior to the 1991 moratorium, and may have been impacted by other factors such as the 2016 harvest, the subsistence harvest for the local market, a disruption to the ecosystem, and detrimental fishing practices. It says that a preliminary cost-benefit analysis, based on calculated harvestable stock of pinkfish and surf redfish, indicates that there would be little benefit from proceeding with such a small harvest and that it may encourage illegal fishing to generate more profits. It says that fishers earned a total of $16,854 during the 2016 harvest. The estimation of the selling prices for the harvested sea cucumbers was $123,631. Pohnpei State collected a $25,000 licensing fee from Young Sun Corporation. Because of those factors, the SPC report recommends maintaining the moratorium on commercial harvesting but it says that if Pohnpei State decided to allow a commercial harvest of sea cucumbers it should at the bare minimum develop a management plan before any harvest is conducted. The assessment provides several management suggestions. The civil action filed by the Mwoalen Wahu against Pohnpei State and Young Sun Corporation in 2016 resulted in a temporary injunction against implementing the planned commercial harvest of sea cucumbers. The case is still before the court for consideration of the issuance of a permanent injunction but it has been stalled for quite some time. Meanwhile, Young Sun has recently set up a large tent for a sea cucumber farming project behind a locked gate at the popular swimming spot at the APSCO dock. In its regulations for a sea cucumber harvest, Pohnpei’s Office of Fisheries and Aquaculture requires a rebuilding of harvested stock through seeding or spawning. It is not clear what method Young Sun is using at their new facility at the APSCO dock and we could not find a way to reach them. 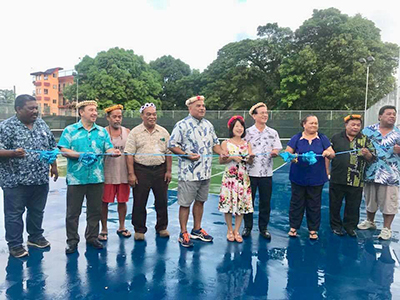 Kolonia, Pohnpei—Tennis courts in Kolonia that have been completely unusable for many years have been given a new birth thanks to a special project sponsored by FSM Congressman David Panuelo. The $150,000 project bill paid for a complete renovation of the courts along with a new practice court. 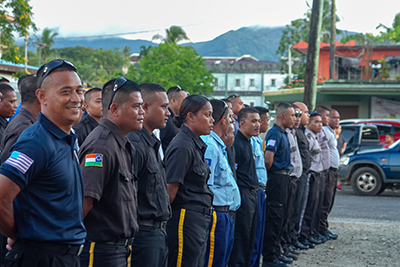 Kolonia Town Mayor, Jose San Nicolas hosted the turnover ceremony this afternoon. Panuelo wrote on his Facebook page that the addition of the new courts means that Pohnpei now has six total tennis courts which means that Pohnpei can now host regional and sub-regional tournaments. He wrote that before the Micro Games nearly four years ago, the Pohnpei Delegation at the FSM Congress funded the renovation of the four courts in Nan Pepper, Pohnpei, at a cost of $300,000. Those courts are still being well maintained and are in consistent use. As this afternoon’s ceremony ramped up, Dr. Bryan Isaac, of the Pohnpei Tennis Club said that the new courts have a few negligible low spots and that the nets needed to be constrained in the center, but that otherwise, the facility was a great addition to the sport. He seemed to think that those little problems would be easily fixed but that the courts would certainly be useful. Present for the ribbon cutting ceremony were Lt. 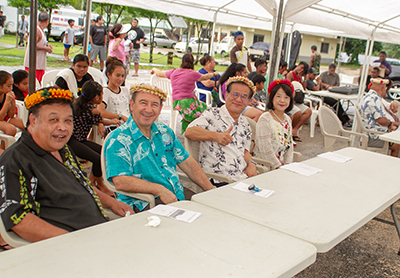 Governor Reed Oliver, Kolonia Town Speaker Jack Harris, Ambassador of Australia George Fraser, Ambassador of Japan Ryoichi Hories and his wife Yuko, Associate Justice Nickondro Johnny, members of the Pohnpei Tennis Club and the Pohnpei Sports Commission along with interested members of the community. Wahnparons Bilimon Henry and Midion Neth were also present. 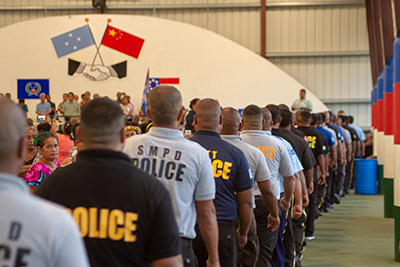 Pohnpei—This evening 63 police officers from the national, state and municipal governments graduated from a ten day law enforcement training course conducted by seven certified officers from the Commonwealth of the Northern Marianas (CNMI) Department of Public Safety. 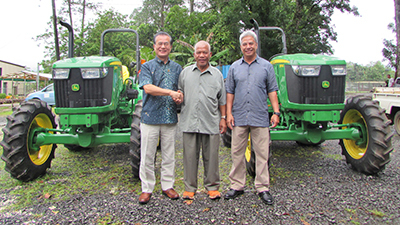 The training was facilitated by an agreement between CNMI Governor Ralph Torres and Kolonia Town Mayor Jose San Nicolas. Officers who participated were trained in “breach team” techniques that are useful when law enforcement officers have to enter a property by force. They were also trained in fire arm safety and shooting techniques. At the graduation ceremony at the Kolonia-China Friendship Gym, each of the officers received a certificate of completion of the training. In addition to the training provided by the government of CNMI, Governor Torres also donated several handguns to Kolonia Town for law enforcement use. Those handguns were shipped to the FSM Department of Justice pending the possibility of their release to the Kolonia municipal government. FSM’s Secretary of the Department of Justice Gallen said that he authorized the use of the handguns for training purposes but that after the training they went back into national government custody. “Handguns are a very dangerous tool,” he said. He said that though the training was a good introduction to the use of handguns he didn’t feel comfortable certifying anyone in the municipal governments to carry one. “It doesn’t mean they’re qualified to use one,” he said. Pohnpei’s Governor Marcelo Peterson was present at the ceremony as were Secretary Gallen, Municipal leaders, and family members of the graduates. The ceremony lasted for several hours. Hotels and apartments on Yap have been booked for months for the 2018 Micro Games that take place this July 15 – 27. Capacity on the small island is limited and other options have been few and far between. But more rooms will be available when the Forever Lucky cruise ship enters the harbor on July 1st. With 146 cabins that include deluxe single, deluxe double and executive suites, room capacity on Yap will more than double during the biennial sports event that is projected to bring more than 2,000 athletes, coaches, officials, volunteers and spectators to the island. It will be docked in Colonia with access to transportation to the Yap Sports Complex and within walking distance of the marina where all water sports events will take place. Colonia, Yap. During a summit meeting between Japan and the Federated States of Micronesia last fall, Japan’s Prime Minister, Shinzo Abe, expressed his gratitude to FSM for consistently and strongly supporting his country in the international arena for many years and noted that 2018 would be the 30th anniversary of diplomatic relations between the two nations. 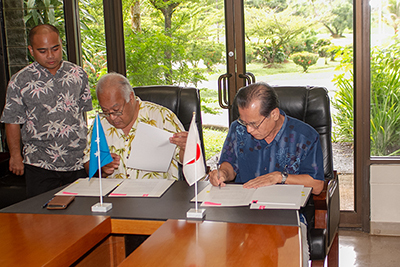 His desire to develop even stronger relations was met favorably by FSM President Peter Christian who replied that he too wished to further strengthen bilateral relations with Japan. FSM Ambassador to Japan John Fritz and FSM Honorary Consul-General to Hokkaido Nobutsugi Kyuribayashi will be among the honored guests. The formal program will include addresses by local and visiting dignitaries; entertainment by students from Yap Catholic High School; and, traditional Yapese and Japanese dance performances. Participating in the event will also be local members of the Japan International Cooperation Agency (JICA) who plan to host a sushi stand, a Japanese treat that is found on every menu in Yap. Other student groups and local organizations are being invited to sell local food, handicrafts and other products in the festival’s marketplace. WASHINGTON – Doug Domenech, U.S. Department of the Interior Assistant Secretary - Insular and International Affairs, this week provided a $497,738 grant to the University of Hawaii Joint Institute for Marine and Atmospheric Research School of Ocean and Earth Science for a project to improve atmospheric and wave-forecasting through the Pacific Islands Ocean Observing System. The funds will help improve data collection about rainfall; change in typhoon patterns; availability of fresh water; and flooding and wave action from severe weather events, including high winds for American Samoa, Guam, and the Northern Mariana Islands. In addition to collaborating closely with the National Oceanic and Atmospheric Administration’s National Weather Service forecasting offices, the project will also respond to the needs of local, regional, and federal government agencies; emergency responders; scientists; resource managers; planners; various academic pursuits; professional consultants; marine engineers; marine operators; ocean users such as fishermen and surfers; and the general public. All U.S.-affiliated Pacific Islands served by the PacIOOS include the State of Hawaiʻi; the territories of Guam, American Samoa, and the Commonwealth of the Northern Mariana Islands; and the freely associated states of the Republic of the Marshall Islands, the Federated States of Micronesia, and the Republic of Palau. Funding for this program is provided through the Office of Insular Affairs’ Technical Assistance Program. FSM—The 4,598 shareholders of the Bank of the Federated States of Micronesia will get a happy surprise when their dividend checks begin to arrive in June. During parallel Annual General Shareholder meetings in Colonia, Yap and Kolonia, Pohnpei on 22 May 2018, bank Chairman/Director Larry Adams announced that the bank had delivered record and near record results in multiple areas of Assets, Deposits, Core Earnings, Capit, Dividend and Asset Backing per share. The net profit for the year ending 31 December 2017 was $2,100,612 or $2 to $25 per share. He said it was by far the best result in the 33 year history of the bank. The Board of Directors approved a record dividend of $1 – 13 per share payable to all registered shareholders of the Bank as of 30 April 2018. The bank’s media release says that this is the 14th consecutive year that the Bank of the FSM has paid a dividend to the BFSM shareholders which benefits the entire FSM community. It says that BFSM is one of the few locally owned successful commercial banks operating in the Pacific. It has 4,598 separate shareholders, 7,452 deposit accounts, and 4,764 loan accounts. Along with Adams and Deputy Chairman/Director Patrick MacKenzie other key directors of the bank and board members are Anna Mendiola, Senny Phillip, John Sohl, and Andy Choor. Chairman Adams also acknowledged the excellent contributions made to the bank by retiring Director Nelperson Etse, and said that the Directors are looking forward to working closely with incoming Director Feliciano Perman. President and CEO Bob De Courteney expressed particular appreciation to the major shareholders, the FSM National Government, FSM Development Bank, each of the FSM State Government and other shareholders) for showing the wisdom and foresight to keep the majority of existing directors. “Continuity of intelligent, connected and high quality Directors and harmonious decision making at Board level, is what lead to great results,” he said. 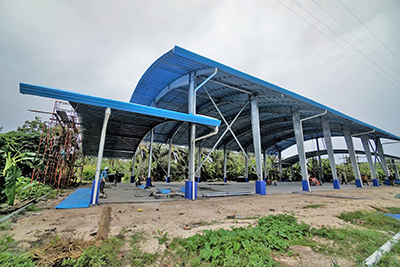 USAID, in partnership with the International Organization for Migration (IOM), marked the completion of all construction activities in Chuuk and Yap as part of the multi-year Typhoon Maysak Reconstruction Project (TMRP) as of April 15th. 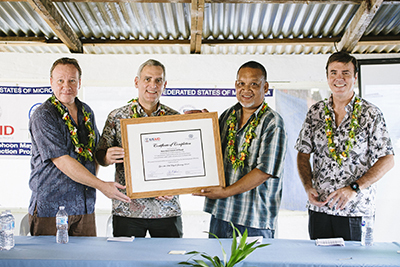 In January, USAID and IOM celebrated the completion of Chuuk construction with a closeout ceremony in Weno. U.S. Ambassador Robert Riley, representatives from USAID, local government officials community members, and many of the IOM staff directly responsible for the reconstruction attended the event. In his address, Ambassador Riley acknowledged the accomplishments achieved through local partnership. 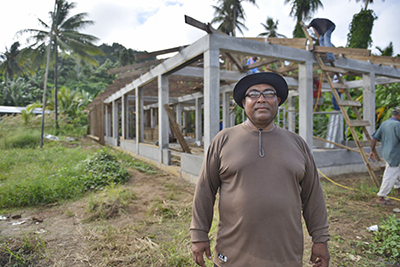 The $42 million USD initiative by USAID repaired and replaced homes and public infrastructure damaged or destroyed by Typhoon Maysak in 2015. In Chuuk, community working groups constructed 328 new houses and 87 public infrastructure facilities, including schools, community homes and dispensaries, spread across 29 islands; both lagoon and outer islands. IOM staff handed over the final home last September and the final public infrastructure facility at the end of December. In Yap, local laborers constructed 94 new houses and repaired or constructed 66 public infrastructure facilities across 5 islands of the remote Ulithi Atoll. 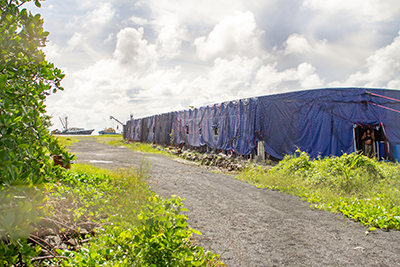 A significant component of the construction in Yap was that of Outer Islands High School (OIHS) on Falalop, which Typhoon Maysak had rendered nearly unusable in 2015. IOM supported the repair and construction of 20 buildings on the campus. The school is crucial to the education of youth in Yap’s remote outer islands, and served roughly 160 to 170 students, according to OIHS principal John Ugulmar. However, the school was forced to limit enrollment during reconstruction due to a lack of space and textbooks. As work was progressively completed on the OIHS buildings, more students were able to return to school. At the end of March, OIHS had just over 80 students enrolled. Teachers have conducted their classes in the completed library, the culture huts or “sometimes under the coconut trees when it’s too hot inside,” Ugulmar said. Aside from simply having new buildings, he is confident in their strength and ability to withstand possible storms. With construction completed, OIHS should be able to be back to full capacity for next school year. Ugulmar looks forward to the entire campus being up and running again. He’s not the only one that feels that way. “Not only the students, but the teachers are also anxious to get back in the classrooms,” Ugulmar said. The IOM-implemented project was completed in partnership with USAID, the FSM Government, the State Government of Chuuk and Yap, as well as the local Chuukese and Yapese communities. In addition to construction activities, USAID and IOM also issued vouchers totaling more than $2.6 million USD to 1,167 households in Chuuk and 188 households in Yap. TMRP utilized a community-based approach to engage local communities, which allowed residents to directly participate in the repair of local homes and infrastructure rather than rely exclusively on contracted labor from international firms. IOM technical teams mobilized and trained 1,429 community workers in Chuuk and 216 workers in Yap in best practices and safety standards in construction. As a result of this approach, $6.4 million USD remained in communities across Chuuk and Yap. 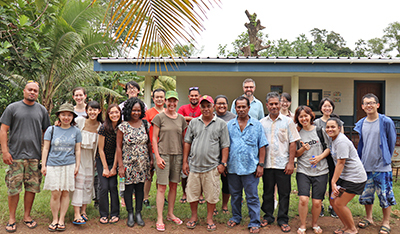 On March 24th to 31st 2018, Bertha Reyuw (Yap) and Bradford Mori (Chuuk), who are Bill Raynor MC Scholarship Recipients at Sophia University in Tokyo Japan, accompanied 12 Sophia graduate students in the Global Environmental Studies Programme with Professor Anne McDonald, on a study tour held in Pohnpei. Micronesia Conservation Trust staff helped coordinated this trip to be possible for the group. These graduate students consisted of three Doctoral Candidates and eleven Masters Candidates (including Ms. Reyuw and Mr. Mori) who are from China, Korea, Great Britain, Africa, and the Philippines. The purpose of this study tour was to have the group experience first-hand challenges of the small island developing nations who are on the frontline of climate change, in regards to climate change adaptation, biodiversity conservation, and island sustainability. The agenda compiled by MCT for the trip included project site visits and meetings with local communities, State and National Government Officials. The trip activities were planned to provide perceptions of the environmental challenges Pohnpei and FSM, as a nation are facing, as well as the actions they are implementing to help reduce the impacts in the pathways of policy making and practical activities. This trip not only taught the group about the environmental impacts and actions taken by local communities and partners in Pohnpei and the FSM, but it also has given them the opportunities to enjoy the island lifestyle and build friendship connections with the local people. The group returned to Japan with full hearts of such memorable field learning experience which is documented in the form of a report and a blog compiled by the group. The report also contains the group’s observations and identification of critical elements that need further consideration. The report will be shared once finalized, but the blog can be accessed with this link, (https://genvfsm.wordpress.com/ ). Also, an on-campus Seminar was organized on the 22nd of May, to allow the students to share with others what they have learned from the field in Pohnpei, FSM. Participants of this Seminar were the University’s staff, students, friends as well as honorable guests, FSM Ambassador Mr. John Fritz, and APIC members, Mr. Shoji Sato who is a Former Japan Ambassador to FSM, and Mr. Megumi Araki. During the month of May, Enimwahn Development Association, Inc. (EDA) was granted funding from the Global Environment Facility Small Grants Programme FSM to theamount of $42,225. The project “Enimwahn Development Association, Inc. (EDA)” 12 month goal is Protecting Food Security in Enimwahn community through improving sustainable agroforestry techniques and utilization of diversified climate tolerant food plants and crops with full community participation. The Small Grants Programme, FSM is part of a global GEF funding modality initiative implemented by UNDP on behalf of GEF partnership to provide grants to FSM NGOs and community based initiatives that works to mitigate threats to the environment, support sustainable community livelihood development and to build capacity of development and to build capacity of its grantees to be more effective. The Programme is hosted by the UN Joint Presence Initiative office in country on Kaselehlie Street in Pohnpei.